A friend asked why I do not seem to be taking as many photos as before. I guess the reason is, photography has been work-related for me all long, from journalistic photos for the school magazine to commissioned portraits in recent years. The current me is satisfied with taking the best group photos possible in gatherings of friends and family—some friends probably remember the portable, top-heavy camera I bring with me these days ^_^! Dedicated video lenses usually feature stepless aperture to allow for smooth adjustment of exposure. Most still photography lenses, in contrast, feature stepped aperture adjustment. This guide demonstrates how to “de-click” Canon FD lenses to get stepless aperture. De-clicking is easy. All you need to do is to unscrew the rear and take out one or two things. The process will not introduce dust into your lens—the optical assembly is sealed in one piece inside the lens. There is a “cheat” that gives you continuous aperture adjustment without the hassle of opening up the lens. All you need to do is set your lens to the smallest aperture, then turn the ring on the FD adapter. The downside of this cheat is you do not have any indication of which f-stop you are at. With that in mind, if you still believe de-clicking is useful—and I personally do find that being the case—here is a quick demonstration on how to do so. You need to remove the two parts indicated by the blue arrows if you want the aperture ring to rotate smoothly. If you can stand the un-smoothness, however, you can keep the parts on—with the parts on, step 2 alone is actually sufficient to give you stepless aperture. 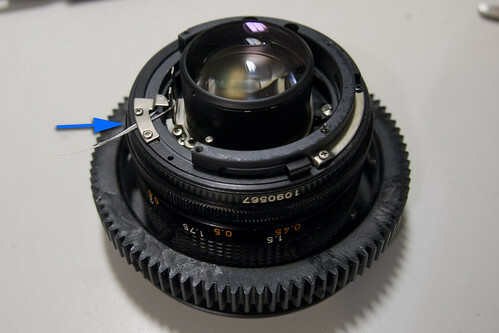 On lens such as the the 28mm—in which you lock by rotating the whole lens—the piston underneath the aperture ring provides the click. Remove the piston de-clicks the lens. If you have kept the two parts on in the first step, you can now re-assemble the lens. 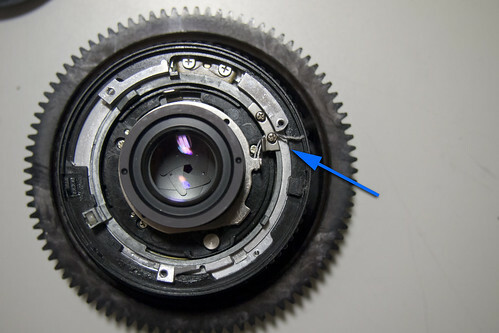 If instead your FD lens locks with a rotating metal ring, you will need to remove the two ball bearings inside the aperture ring. 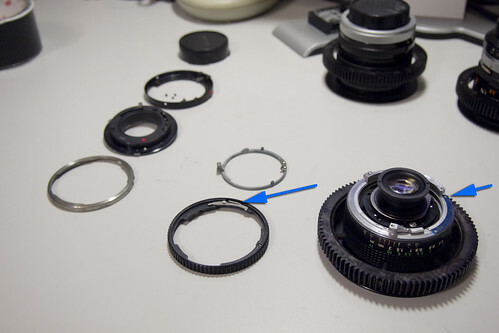 At this point if you re-assemble the lens without the jiggering parts, you will notice that the aperture bounces back when you try to set a small aperture. 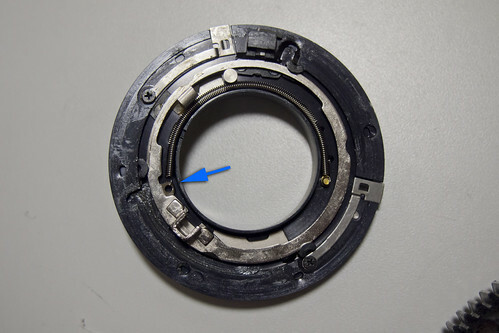 This is due to the spring mechanism used in FD lens’ aperture control: the aperture ring is actually only capable of driving the aperture in one direction; reverse movement is driven by the spring holding the aperture selector. Removing the spring solves this issue. 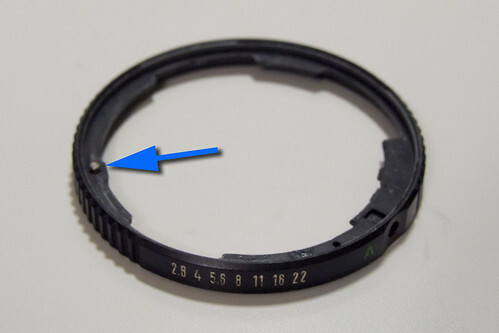 Because the aperture ring is designed to only drive the aperture in one direction, you need to manually link the aperture ring to the diaphragm. Here I used a short polyester thread, lopping around the coupling pin on the diaphragm and held underneath the link on the aperture ring. Make sure the aperture size match up with the f-stop indicated on the aperture ring. 5. Re-assemble the lens. It’s done! I have the same view. It’s not that demand for journalistic photo has decreased, but rather the supply has vastly increased, thanks to ever more amateur photographers with ever better skills and cameras. The result is an increase in journalistic photos, but a substantial decrease in professional photojournalism. Oliver E. Williamson, the Edgar F. Kaiser Professor Emeritus of Business, Economics, and Law at the University of California, Berkeley, a pioneer in the multi-disciplinary field of transaction cost economics, and one of the world’s most cited economi…sts, is a winner of the 2009 Nobel Prize in Economic Sciences. 10 times better than The Next Generation series of movies. Finally we see again a Trek movie that doesn’t look like a two-hour TV episode. No bad, better than Da Vinci Code in my opinion. The story is predictable without reading the novel, but I would say it still makes the cut as an entertaining thriller. Sometimes pictures I shot get posted to websites other than my own. One such instance is Owen Ozier’s website. Yes that guy on the front page is Owen and I took that picture. Owen is a third year PhD student in Berkeley’s economics department, just as I am. Owen however has a much more diverse experience, in particular he has been conducting research in Kenya. Now my two monitors finally give me almost identical rendering. After watching it you would appreciate how much effort has been put into the making of a lens. I received a new pair of headphones–the 7th pair inside my room at this very moment–a pair of Sony MDR-7506. It’s expensive (US$99) but I have to say the difference with my other headphones is in the magnitude of night and day.